The environmental movement has long been built around two themes – “woe is me” and “shame on you.” But in the age of global human influence, the Anthropocene, that approach ends up resembling a circular firing squad. Is the palm oil developer the villain, or the person buying the KitKat bar or “green” biodiesel fuel derived from palm nuts? Andrew Revkin, building on more than 30 years of environmental reporting, outlines a fresh approach to fostering durable progress on a complex, turbulent planet — one focused less on unachievable goals and more on building the human capacity to produce positive environmental and social outcomes. Revkin has been writing about environmental sustainability for more than three decades, from the Amazon to the White House to the North Pole, mainly for The New York Times. He has won the top awards in science journalism multiple times, along with a Guggenheim Fellowship. As the Senior Fellow for Environmental Understanding at Pace University, he teaches courses in blogging, environmental communication and documentary film. He has written acclaimed books on global warming, the changing Arctic and the assault on the Amazon rain forest, as well as three book chapters on science communication. Drawing on his experience with his Times blog, Dot Earth, which Time magazine named one of the top 25 blogs in 2013, Revkin speaks to audiences around the world about the power of the Web to foster progress. He is also a performing songwriter, was a longtime accompanist for Pete Seeger and recently released his first album of original songs, which was hailed as a “tasty mix of roots goulash” on Jambands, an influential music website. Two films have been based on his work: “Rock Star” (Warner Brothers, 2001) and “The Burning Season” (HBO, 1994). 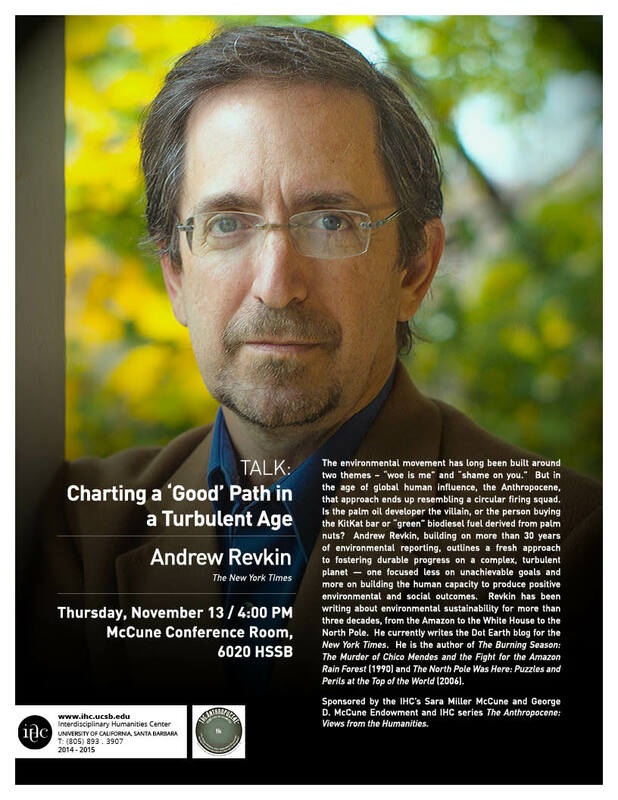 Click here to listening to a recording of Andrew Revkin’s talk for the IHC series The Anthropocene: Views from the Humanities. Sponsored by the IHC’s Sara Miller McCune and George D. McCune Endowment and IHC series The Anthropocene: Views from the Humanities.